Ethan lives with his mother and his father isn't in the picture. While Ethan is extremely intelligent and knows everything there is to know about astronomy he's socially awkward and doesn't have any friends. Something happened to him when he was a baby, but his mother Claire hasn't told Ethan anything about it. She tries to keep her son safe and protected, but that's just an illusion. When Mark, Ethan's father, is back in Sydney her secrets are bound to come out. How will Ethan react when he learns about his past and what exactly did happen to him when he was a baby? Relativity is an impressive story. Ethan is such a sweet, gifted child, but he's also vulnerable and an easy target for bullies. My heart ached for him when I read about everything he's going through. He's strong, inventive, kind and forgiving, which makes him charming and endearing. Claire is closed off. She used to be a successful dancer, but is now living in the shadows. Ethan is her number one priority and she tries to shield him from the truth. They live such a secluded life. Claire doesn't have friends or family, so she and Ethan spend most of their time together. This might sound grim, but they love each other and there are plenty of happy moments. Their bond is fascinating. Claire has her flaws, but after reading about her past I could totally understand her behavior. Mark is smart and has always been interested in science. What happened with Ethan when he was a baby changed his life completely. I kept feeling ambivalent about his character, which is probably Antonia Hayes's exact intention. Reading about the family dynamics and slowly finding out what happened to Ethan when he was a baby kept me on the edge of my seat. Antonia Hayes writes about physics and astronomy in a way that is easily understandable. I absolutely loved that. 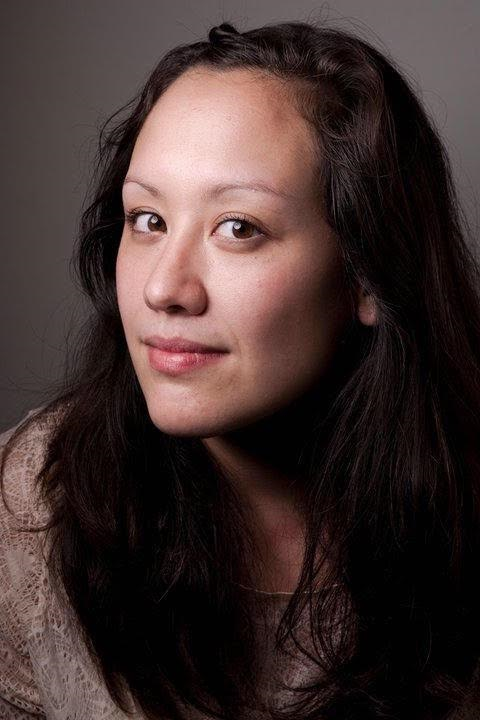 She cleverly combines science with deep emotions and together this results in a multilayered imaginative story. I admired the way she combines creativity, rawness, brilliance and life altering mistakes with friendship and love. Nothing is black or white and she explores the grey in between in a sharp and original manner. She kept surprising me over and over again, which is something I thoroughly enjoyed. 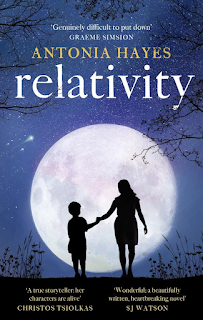 Relativity is a story about a bright and resourceful child. Ethan might be academically advanced, but he's also just a boy who loves his mother, but also wants a father and that is something Antonia Hayes never forgets. This results in a moving and sometimes shocking story. I really liked the complexity of it and loved the way Antonia Hayes challenges her readers. 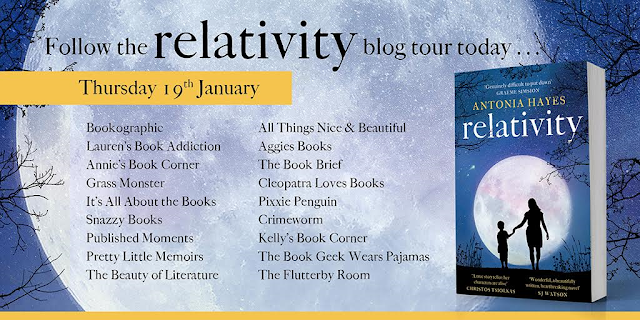 Relativity is a refreshing debut by an author who clearly has a lot of talent. Relativity would be a great choice for readers who like fiction about science and are interested in stories about complicated family relationships. It sounds like a lovely story.I can't wait to read it.Thanks for sharing it. I love stories that have some science included. Sounds like an original story. I love books about children. This sounds intriguing! I like stories that involve family relationships. This sounds like an intriguing book. I enjoy books about children and family. Books that use science to mirror/ create a metaphor are right up my ally. Thanks! What a terrific beginning to a long writing career. Suze, your reviews never let me down. I know I can rely on them to guide me to new authors and books that I'll enjoy.